Central to the game is building up a party. The party screen displays detailed information about your forces. It is opened by clicking the Party button when on the world map or by pushing P. The party screen is unavailable during combat. A: Companions in your party (including your own character) are listed here along with any active party skills and the person it belongs to. Party skill bonuses can be earned by spending points on party skills with the player character (not companions). The bonus will be added to whoever has the highest party skill. A chart detailing the bonuses is listed on the right. An additional (+1) can be earned from certain Books. If companions are listed as Wounded their party skills will be disabled until they regain some health. B: Your money and the total weekly wages your men cost you. Clicking on an individual troop will show how much each man in that stack earns. Companions also have weekly wages. C: The Talk button allows you to converse with your men (only on the world map and initial town screen (not submenus)). You can customise a companion's equipment by talking to him. D: Determine party order. Troops load into battles from top to bottom, so putting your troops in the right order is crucial. Wounded men are skipped. The post-battle party screen replaces the Party Skills section with a Rescued Prisoners list, as well as enemies to take captive. E: If a troop stack has a + beside it you can upgrade some of them into better troops types. Some upgrade points allow you to choose which upgrade path to take. You can't go back, so once you've chosen a path for that particular man he will only be able to continue along that line. If the troops don't have enough experience to upgrade the button will be greyed out, and if they reach the end of an upgrade path the button will disappear altogether. Refer to the faction pages for troop trees showing the upgrade progress of all troops in the game. F: When troops or prisoners are selected you can disband them using this button. This removes them from your party without confirmation. If you make a mistake you can use Reset to return them to their places. G: This lists all the troop types and companions in your party (including your own character). The number at the top is your active party size followed by your maximum party size. Multiples of the same troop types are listed with a number in parentheses. Wounded troops (displayed after a / in the total) won't enter combat, but wounded companions will unless they shown in red (severely wounded). H: Morale controls a variety of factors, and is discussed below. I: Prisoners are listed here, if any. You need at least one point in Prisoner Management in order to take prisoners. You can recruit men from taverns and villages. Troops in the Mercenary line are available from taverns while villages offer Recruits of their faction. If you own a village fief and have improved their prosperity you can go there to recruit higher-level faction troops. Your standing with a village affects how willing they are to join you; if your standing with them is 0 or below you may be told that nobody is willing to join your party. Troops hired in taverns don't care about your standing and will join you as long as you have the cash. You can also recruit men by taking prisoners or freeing the prisoners of your enemies. Your enemy's prisoners can be freely added to your party from the post-battle party screen. 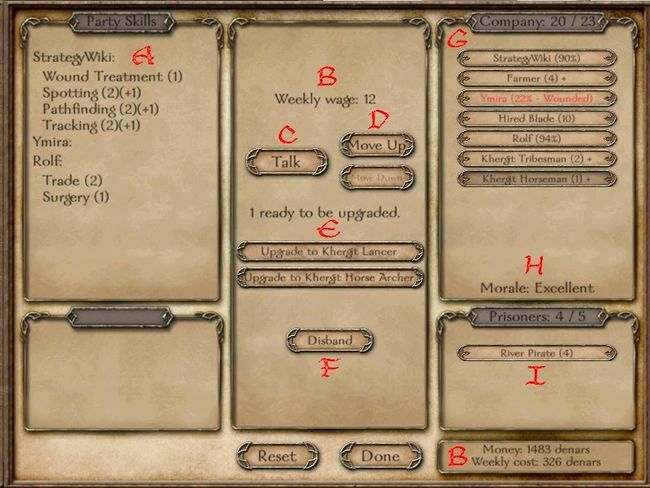 To recruit from your own prisoners click Camp, choose Take an action, and select Recruit some prisoners into your party. Prisoners will accept on a per-stack basis—no matter how many men are in the stack the whole lot will agree to join or not, and only one stack at a time will be available regardless of how many stacks you have. You can only try to recruit from your prisoners once every 24 hours. Bear in mind that each prisoner you recruit costs you three points of morale (freed prisoners cost none) so you may want to build up your morale before you recruit a large number at once. Some of your recruited prisoners will randomly run away in the night. This only happens on the first night; you can get around this by putting them in a town or castle garrison and resting until morning, then returning them to your own party. You should aim to have a good balance between different troop types. While you can win battles with a purely cavalry or infantry force a few ranged troops will definitely be helpful. If your chosen faction lacks a particular troop type you can recruit from prisoners or neutral villages to get what you need. Troop positioning is crucial; troops are loaded in a top-to-bottom manner, so those at the top of the list will see the most combat. Wounded troops are skipped. Generally speaking, you should put the most powerful troops at the top of the list, with the more vulnerable troops lower down the list. This means the lower-level troops won't see much combat (sometimes none at all) but will still gain overall experience. You can upgrade these weak troops more quickly by learning Trainer or teaching it to your companions. You can reduce the casualty rate by putting points in Surgery. Wound Treatment will significantly improve troop healing speed and as such improve the supply of available troops. Generally speaking, cavalry have a huge strategic advantage due to the extra freedom and maneuverability offered by horses. Footmen tend to fare poorly against cavalry but are strong against archers. Ranged troops are last of all; while they can seriously damage non-ranged enemies before they even get close, their ammunition and reloading rate is very limited and their accuracy is low. Ranged troops tend to have the lightest armor so are in great danger if enemies draw within striking range. Once they reach higher levels ranged troops will become significantly more effective, and the highest-level ones will be able to deal significant damage to cavalry and infantry even from very long distances. Even if you don't really intend to go the cavalry route, having some decent mounted troops to chase after the enemy's riders will be very useful, and will help reduce the number attacking your footmen. In almost all cases, high-level troops will trounce lower-level ones regardless of the target troop type's usual advantages. This is especially true of non-ranged troops going up against ranged troops: projectiles deal limited damage against heavy armour, and by the time they reach the ranged troops they will have a good amount of health left. Once you have built up a force of high-end troops (especially cavalry) losses will go down significantly except when facing similarly high-level forces. For castle sieges your men will all start on foot, so take this into account if you are using cavalry. Some cavalry troops will still do well on foot (such as Hired Blades and Swadian Knights) but others are at a serious disadvantage (such as Caravan Guards). Morale is a driving force behind your party's success. If your men are happy your party will move faster on the map. If their morale drops very low some men will begin deserting. You can view your current morale by going to Reports and then choosing the party morale report. Party size: the larger the party size the bigger the penalty. Leadership: having points in Leadership will make your men happier, and helps offset the party size penalty. Food variety: a wide selection of food makes your men happy, and each consumable food item has a morale bonus attached. More expensive foods naturally yield a higher morale bonus. Recent events: winning battles raises morale, losing battles, running out of food, and retreating from battle lowers morale. 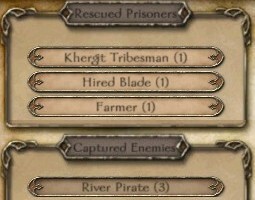 Recruiting prisoners: every prisoner you recruit costs you three points of morale. Starvation: if you have no food your party will begin to starve. Starving troops will soon desert even if other morale influences are positive. The minimum party morale is 0 and the maximum is 99. These numbers are enforced throughout the calculation of the party's morale which means that even if you have a large negative impact (for example -200 from party size), the morale will be set to 0 before considering other factors. This means you can still reach high morale by having a large bonus from later factors. As the last factor for party morale, recent events has the potential to have the biggest impact on your party's morale. You can have a party as large as you would like (subject to your renown/leadership/etc) without fear of members deserting you as long as you keep your troops fed and keep recent events high enough. This page was last edited on 31 December 2010, at 12:17. This page has been accessed 72,231 times.